A three year long study in the rainforests of Borneo has unearthed 123 new species of plants and animals. Amongst the newly discovered species are a 50cm long stick insect, a "ninja" slug and new species of orchid. 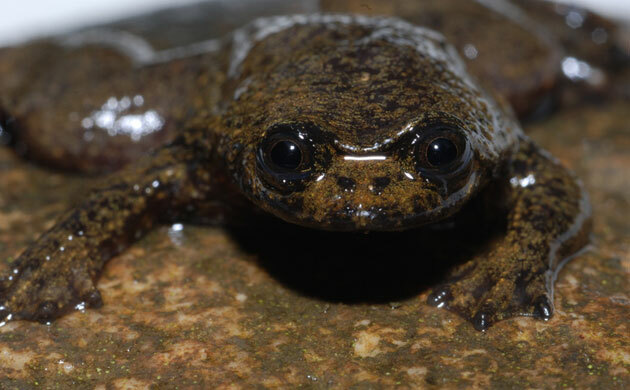 But also amongst the findings are details on the first recorded species of a lungless frog (above, photo from Memo Schilthuizen/WWF), instead absorbing oxygen through its skin and also a colour changing flying frog. Many of these "newly discovered" species have been reported on before (see National Geographic two years ago), in separate reports, but today's collection is being used to highlight the biodiversity of the rainforests of Borneo as a new agreement is signed to protect the wildlife there. The superb science section of the Guardian Newspaper has a great article on the findings and the protection plan (click here) and a brilliant photo gallery of the weird and wonderful creatures discovered, here.